News Movement students prepare to tackle a gun violence nationwide gun violence project by participating in a webinar with The Trace fall 2018. FLINT, MI — Flint-area teens were chosen to participate in a nationwide gun violence project spearheaded by TheTrace.org, a news website focused on gun violence in the US. The project, “Since Parkland” features obituaries of young people who have been killed in gun-related incidents since the Feb. 14, 2018 Parkland, Fla. shooting where students were shot and killed at Marjory Stoneman Douglas High School. The incident caused a national outcry for gun violence awareness and led to walkouts in schools across the nation. 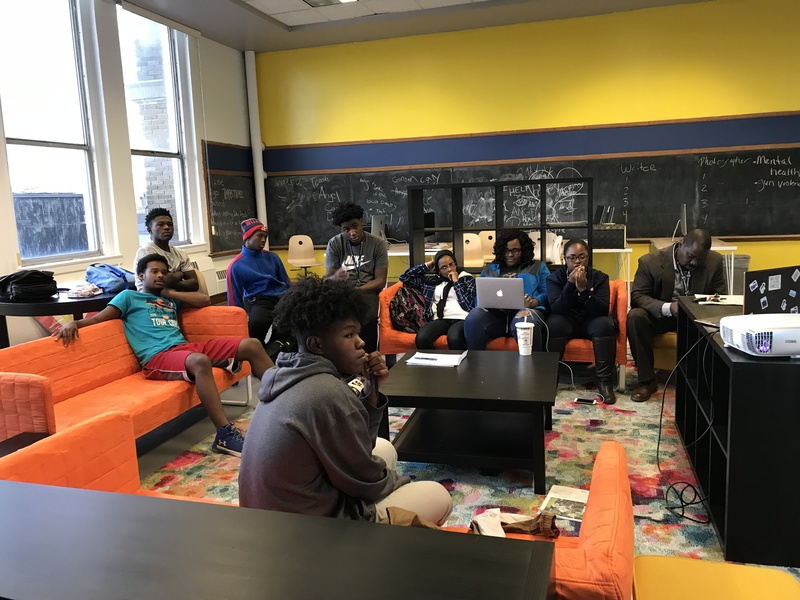 Five Flint-area students worked with News Movement, a youth journalism program housed at Sylvester Broome Empowerment Village on Flint’s north side, along with nearly 200 other teenagers across the nation to help complete the year-long project. Destiny, 15, lives on Flint’s north side where she has witnessed gun violence first hand. On January 1, 2018, 10-year-old Jacques Allen was killed during a drive-by shooting while at home with his grandmother just a few houses away from her own. According to data from The Trace, an estimated 1,200 young people died from gun-related incidents since the Parkland shooting. The data collected for the project includes youth who died in school shootings, domestic violence incidents, drug homicides, unintentional discharges, and stray bullets. It does not include people killed while injuring someone else, police-involved shootings and suicides. News Movement is a youth journalism program developed by Brown Impact Media Group, the parent company of Flint’s news website FlintBeat.com. The program, housed at Sylvester Broome Empowerment Village, teaches youth in grades six through 12 various journalism skills including news writing, photography, videography, and graphic design. It kicked off July 2019 with a $75,000 grant from the Ruth Mott Foundation. For more information about News Movement contact program coordinator Jiquanda Johnson at (810) 447-0676 or email her at jiquanda@brownimpact.com.